Hol­ly­wood screen­writer, Stu­art Beattie, who was respon­si­ble for Gears of War screen­play for New Line Cin­ema last year, has writ­ten the new Halo script. Word says that Microsoft like it and that they are dis­cussing pos­si­ble plans for it to be made. Bet­tie beleives the old style Halo movie inca­r­a­tion is dead and is ready to release his vision, Halo: The Fall of Reach, a pre­quel to the first game. John Gau­diosi finds out what this vision is, in his inter­view for game daily. See the full tran­script below. And thanks to Blair Allan for send­ing us this news. 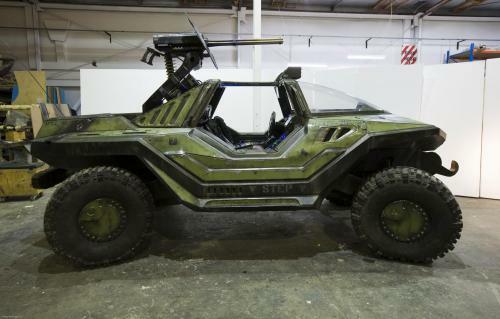 Who hon­estly knows what is going on with the Halo Movie adap­ta­tion at the moment? Last week Neill Blomkamp came out and stated that the movie in its cur­rent form was dead and that we shouldn’t look for­ward to a Halo Movie any time soon. I’d seen sto­ries like this before so I was a lit­tle reluc­tant to post the news arti­cle, that and it would mean the end of this blog, which isn’t some­thing I look for­ward to. So I held on with what lit­tle hope I had left. Seems like my hope wasn’t entirely in vain. This week Peter Jackson’s rep­re­sen­ta­tive, Ken Kamins spoke to Com­puter and Video games. It first out­lines the das­tardly ways that Fox and Uni­ver­sal attempted to force the film mak­ers to a less than oppor­tune deal. Most impor­tantly how­ever, he states that every­body is supremely con­fi­dent in Neill and that pro­duc­tion is still under­way and that give Halo 3’s $300 mil­lion in sales a num­ber of movie stu­dios have renewed inter­est. Many mis­lead­ing reports have been filed about the pur­ported re-firing of the Halo Movie engines. These reports assumed that a Halo GAME and FRANCHISE dis­tri­b­u­tion deal, made by Fox, extended to the movie. This is not the case and NO MOVIE DEVELOPMENT plans have as YET been confirmed. This deal does how­ever look favourably on the Halo movie process and could ini­ti­ate the future devel­op­ment. Though, as it stands, we are still not mov­ing any­where, our igni­tion is firmly set to off.